Since 1997 Chianti South has been serving fine italian cuisine that combines the very finest of the traditional and new italian recipes. Only The freshest ingredients are prepared with expertise to reflect the authentic cooking of Italy, with soups, sauces, and pastas made in our own kitchen. 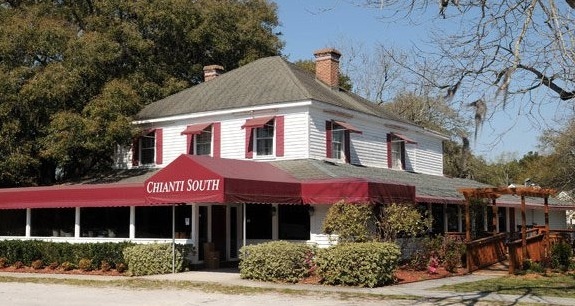 Chianti South is located in a historic landmark built in the early 1900’s and set among ancient Live Oaks to offer a perfect setting for a truly remarkable dining experience. Our deck and side gardens were renovated, transforming them into an amazing oasis of lush plants, exotic flowers, and an elegant water fountains for a setting reminiscent of a Tuscan estate courtyard. We welcome you to our new site to view our menu, our award winning wine list and photos of our restaurant. For questions, comments, or reservations please select the ‘Contact’ page. Since 1997 Chianti South has been serving fine italian cuisine that combines the very finest of the traditional and new italian recipes. Chianti South is located in a historic landmark built in the early 1900’s and set among ancient Live Oaks to offer a perfect setting for a truly remarkable dining experience. We welcome you to our new site to view our menu, our award winning wine list and photos of our restaurant. For questions, comments, or reservations please select the ‘Contact’ page.